Amazon.com description: Product Description: One of the most distinguished women of colonial America, Eliza Lucas Pinckney pioneered large-scale cultivation of indigo in South Carolina, managed her father's extensive plantation holdings, and raised two sons - Charles Cotesworth Pinckney and Thomas Pinckney - who would become celebrated patriots of the new nation. 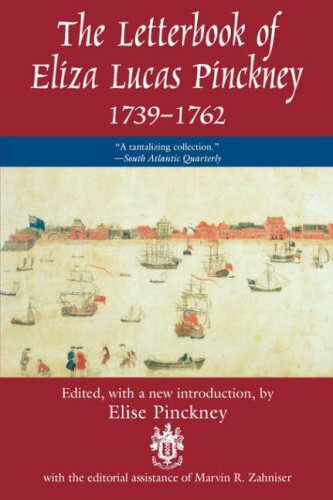 Pinckney's lively letters reveal intriguing details about an eventful life, including her myriad interests, changing politics, innovative ideas about slave education, voracious reading habits, unusually happy marriage, and devotion to her children. About: One of the most distinguished women of colonial America, Eliza Lucas Pinckney pioneered large-scale cultivation of indigo in South Carolina, managed her father's extensive plantation holdings, and raised two sons - Charles Cotesworth Pinckney and Thomas Pinckney - who would become celebrated patriots of the new nation.